Week 1 of the 2011 season was not going well for referee Tony Corrente and his crew. The California native and his six other partners worked the Ravens-Steelers game in Baltimore — a heated rivalry then, as it is now. The Steelers and Ravens were determined to intimidate each other during the play, as well as after the whistle. The officials had to work hard to keep the players separated and keep peace. Finally, the hatred boiled over into a full-fledged fight. Corrente did his job — he separated the players, but in the fisticuffs, he took a hard spill and hit his head (video). Corrente recovered and continued the game. Afterward, he was still sore and had a choice between acetaminophen or ibuprofen. He chose the ibuprofen, which thins the blood. Over the next few days, he woke up with blood on his pillow. He also coughed up blood. Alarmed, he went to the doctor, and physicians made a devastating discovery. There was a cancerous tumor at the base of Corrente’s tongue. He had throat cancer. At the time, the referee stated that if he hadn’t been knocked down, and if he hadn’t taken painkiller that thinned his blood, causing the tumor to bleed, the cancer would have stayed hidden until it was advanced and more difficult to treat. In a strange twist of fate, the fight saved Corrente’s life. Corrente works a game in 2011 while undergoing cancer treatments. Corrente immediately began a cancer treatment that included radiation. He continued to work during the 2011 season, but by Thanksgiving, the cancer treatment had begun to take a toll on the referee. He stepped away from the field for a few weeks, but returned to officiate a playoff game. He then began intensive cancer treatment in Houston, which turned out successful. 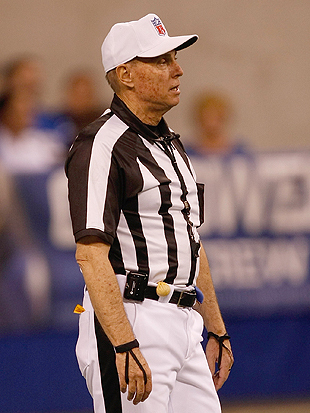 Corrente was given a medical okay to return to the field and officiate the 2012 NFL season. Officials remember certain games for certain reasons: a great call, a missed call, a funny moment, a special play. But I’m sure as Corrente prepares to officiate today’s game game in Baltimore — his first game there since the incident — his mind will drift back to a painful afternoon in 2011. Pain that ultimately helped safe his life. Video — NFL Films Presents: Back in the Saddle, a documentary short film of Corrente’s fight and return to the field. Tony Corrente was one of my high school teachers in California back in the day.He is a wonderful man.Those of us that have known him from La Mirada High were saddened by his diagnose, but knew he would make a full recovery and continue to do what he loves.It is amazing that one incident can change your life and ultimately save it! He still has one of the funniest ref blooper videos on YouTube when his crew had a bad day at the Miami/Indy game two years ago and yelled God dammit! to another official while his mic was still on……. Good to see his cancer story had a happy ending tho…..Did he ever smoke or chew tobacco?? Tony is a great guy! I met him in person and I wish I had him as a teacher!!!! Tony, great job today my good sir. Happy Holidays to you. Keep being you!